After over three days of suffering the effects of Hurricane Harvey, which has hit Houston with the most severe flooding in recent memory, residents began to take stock of the catastrophic damage that left many homeless, destroyed untold amounts of property, and ground daily life to a halt. Leaders of the Jewish community told Hamodia how they and those around them have fared and of the efforts to help those in need. Rabbi Barry Gelman leads the United Orthodox Synagogues [UOS] of Houston, the city’s largest shul, whose community has been hard hit by the massive flooding. “Almost every house [of members of UOS] has been flooded, except for a few who were on very high elevation or were very lucky,” he told Hamodia. “Hundreds from our shul have been affected and some will be out of their homes for many months.” Whether residents have electricity or running water differed from block to block. Rabbi Gelman himself was evacuated from his home this past Motzoei Shabbos by boat and he and his family have been staying with friends since. He said that some 30 members of his congregation have been left homeless, spread out between hotels, temporary shelters, and neighbor’s houses. “People are trying to start cleaning up now, but it’s not so easy, since it’s still raining heavily,” said Rabbi Gelman. UOS’s building, which has been hit by flooding in the past, he said had been “devastated” after having taken in between six and seven feet of water. All but one of the shul’s sifrei Torah were moved to safe locations before Shabbos and the one that remained was successfully rescued. On Tuesday, some of its minyanim went on in a temporary location. The Meyerland neighborhood was also hard hit. Rabbi Gidon Moskovitz of the Meyerland Minyan told Hamodia that over half of his congregants had flooding of over four or five feet in their homes. On Tuesday, the shul offered supper for the many in the broader community whose homes had been flooded. It was prepared by several women who are members of Beth Rambam, a Sephardi congregation. It is but one small example of the collective effort to help those reeling from the effects of the mass flooding. As waters began to recede in many areas, concern mounted about dwindling food supplies at local retailers, particularly for kosher goods. Rabbi Zaklikofsky said that flooding on the main level of his home had forced the family to live upstairs for the last 48 hours, a common occurrence for those in flood-affected areas. Their Chabad effort is one of many such endeavors to bring help from other parts of the country. Supplies have been sent from Dallas, and kosher supermarkets from as far away as New York and Lakewood have offered to send trucks as well. Food is but one of many needs that volunteers from Jewish communites near and far are trying to fill. Hatzolah volunteers from around the country have arrived to help with evacuations and medical emergencies, often carried out by boat. National organizations including the Agudath Israel and the Orthodox Union have led efforts to raise funds and assist the many in need. Rabbi Baruch Ber Bender, Director of the Five Towns-based Achiezer organization, said that his organization plans to send a team to Houston in the coming days to assist in recovery efforts. 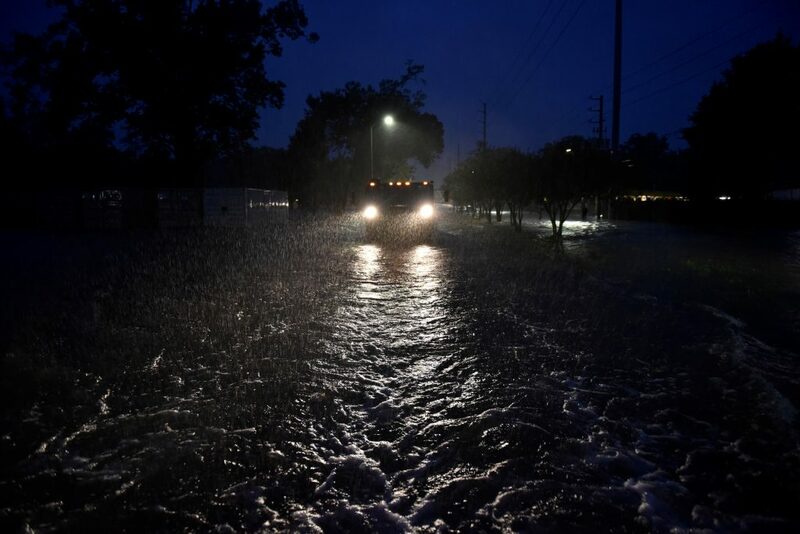 Rabbi Yerachmiel Garfield, Menahel of Yeshivat Torat Emet of Houston, said that in his area, known as Fondren, relatively few homes were flooded and lives were slowly getting back to normal as the emphasis switched to helping those who had been hit harder. There, grocery stores had opened as well as some kosher restaurants. “There’s baruch Hashem no drama here, but we are mobilizing to see what we can do for the other neighborhoods, things are horrific there,” he told Hamodia. On Tuesday, Torat Emet held an online learning program for students and hoped to be open on Wednesday. “The building has some flooding, but it’s manageable…if we’re able to have classes, I think we might be the only school open in the whole city,” he said. Rabbi Moshe Friedman, director of Houston Kollel, also located in Fondren, said that the kollel had actually been able to continue functioning through the hurricane. Rabbi Gelman said that amid the unprecedented devastation, people in the community were doing their best to cope and help those who need it most. This article appeared in print on page 1 of the August 30th, 2017 edition of Hamodia.